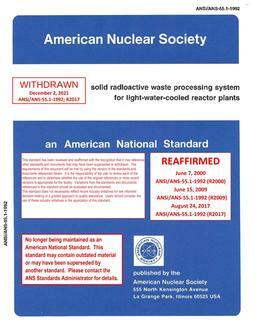 This standard establishes General Safety Design Criteria which constitute the minimum safety requirements for liquid metal reactor (LMR) nuclear power plants and are intended to be used for the design for LMR's in lieu of the General Design Criteria for Nuclear Power Plants in the Code of Federal Regulations, Title 10, Part 50, "Domestic Licensing of Production and Utilization Facilities, Appendix A, "General Design Criteria for Nuclear Power Plants" . These criteria are intended to be applicable to LMR designs which use various arrangements of components, such as those characterized as loop designs, pool designs or combinations thereof. These reactors use sodium in the reactor coolant system and operate with a fast (high energy) neutron spectrum.